Swatara Water Trail – Its all about Clean Water. Founded in 1970. Mission: "To promote the conservation of the natural resources of the Swatara Watershed by conducting scientific investigations and research, disseminating information, conducting educational programs, sponsoring conservation projects and all activities incidental thereto." Read more in the link at the top of the page. A 33.69-acre parcel along the Swatara Creek at 1929 Blacks Bridge Road, Annville (East Hanover Township, Lebanon County PA). Boat access, 960 square foot pavilion; 240 square foot stilted office and porch, approved public water source with a flow rate of 25 gallons per minute at the pump house; Primitive camping; and 3,341 feet of riparian buffer that shades and cools the Swatara, slows evaporation, and limits runoff and erosion. Because we start or end our sojourn and River cleanup at this site each year, SWA considers this site an essential hub in the wheel of the Water Trail, which is recognized by both PA and the nation, and connects to the Captain John Smith Water Trail. Read more in the link at the top of the page. Recognized both state and nationally, the Swatara Water Trail is 60 miles in length, created by Swatara Watershed Association in cooperation with PA DCNR, PA Fish & Boat Commission, and the National Park Service with public launches established about every 7 miles. Maps point out historic, geologic, scenic, and other recreational areas as well as hazards like two dams. Read more in the link at the top of the page. On Old State Road/Bear Hole Trail in Swatara State Park, hike, bike or horseback ride to the Armar Bordner Cabin. Carry in and carry out your lunch and trash. Drive thru Swatara State Park 9AM-3PM the 2nd Fri & Sat monthly & 4th Fri & Sat Mar, Apr, Sep & Oct. Donations to Swatara Watershed Association for use and/or maintenance of the Bordner Cabin are most welcome and appreciated. Explore Aycrigg's Falls too. Read more in the link at the top of the page. Wells in the county can become polluted or go dry. In fact, the Bethel area is a deficit area where enough rain doesn't fall to recharge used groundwater. As a result, and because our population has almost doubled since the early 1950s, more and more people depend upon a clean public water supply. The water on earth today is the same amount of water that was here at the beginning of time. We need to be good stewards of the earth, and shepherd the Swatara Creek, a source of drinking water, recreation and wellness in our back yard. Read more in the link at the top of the page. Always the first weekend in May. Travel 30 river miles over two days. Sleep on the banks of the Swatara Enjoy good food, good company, and take home lusty tales of adventure. Read more in the link at the top of the page. Water wars are fought in many nations. In 2019, California came out of a 7-year drought. The Swatara Watershed Association supports hundreds of thousands of people, and we are growing. Water supply is at a critical point. We need the American Water Company, Lebanon Water Authority, and United Water Company to present a unified plan so that all citizens can get behind a Water plan for future generations of children and their families in the Swatara Watershed. In the interim, do your part to conserve and reuse water. Read more in the link at the top of the page. The Swatara Sojourn is in it's 31st year, rotating between the upper and lower half of the 60-mile long Swatara Water Trail on Swatara Creek. Often we pick up litter as we go to leave the Swatara better than we found it. Scout troops are a common sight on the Swatara Sojourn. Eagles scouts help maintain the Trail too, refinishing or installing new signs, building boat ramps, and general maintenance. What a great partnership. Follow us on Facebook for "real-time" issues and discussions. The Swatara Creek Watershed Association, Inc. was founded in 1970 in response to encouragement from the Chamber of Commerce and State and federal agencies to promote conservation of the Swatara Creek Watershed. The corporation was active in the 70’s then became dormant. Approximately 1986 a group of citizens became concerned about landfills being projected close to the Swatara Creek in Schuylkill County, PA. As a result, they formed an association known as Citizens Coordinating for Clean Water (CCCW). 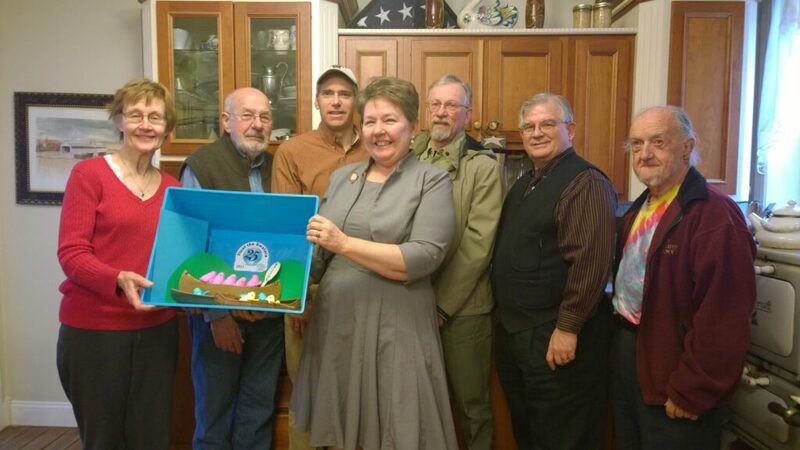 This group ultimately became active with regard to broader aspects concerning the Swatara Creek Watershed. 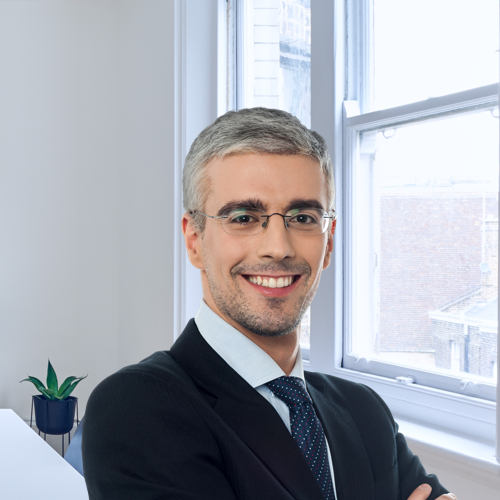 The increased size of the organization to over 100, expanded activities, and availability of government and private grants to support some of its educational activities caused CCCW to consider incorporating. Several of the directors of the Swatara Creek Watershed Association were involved in the affairs of CCCW and it was suggested as a matter of economy to reactivate Swatara Creek Watershed Association, Inc. whose original purpose matched those of CCCW. The last directors of the corporation met and agreed to become active again and to assimilate the activities of CCCW. In 2009, the organization’s name was shortened to Swatara Watershed Association. 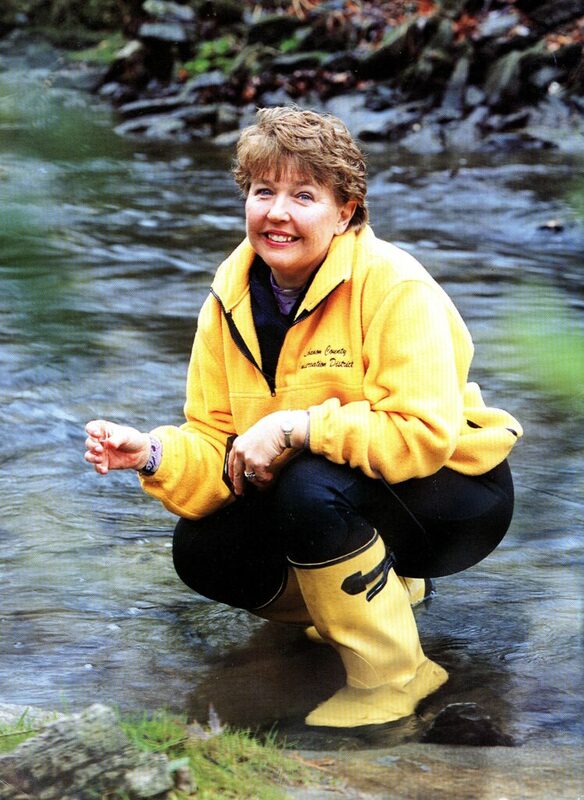 Jo Ellen Litz has been president of the Swatara Watershed Association for over 30 years. As a First Class Girl Scout, it’s her passion to protect Clean Water. Her father took her trout fishing so she got to see what clean water is all about. Her grandfather took her swimming in the Little Swatara Creek where here sister came out with leeches all over her body. Her mom took her swimming at Lion’s Lake where pig manure ran into the entrance, and she’d get painful boils in the days that followed. Her husband took her scuba diving in lakes, rivers, grotto’s, and oceans where she saw American Eels, starfish, whales, dolphins, sea horses, barracuda, and many other creatures. She is certified as a Rescue Diver, and volunteered on teams that recovered drowning victims and discarded guns used in homicides. A graduate of Cedar Crest High School, Lebanon Valley College, and Kennedy Western University, Jo Ellen also ran Lebanon (Auto) Body Shop where she handled hazardous waste, and she serves in her 5th term as a Lebanon County Commissioner. She brings a unique blend of conservation, business and government experience to the table. Ben has more than forty years of outdoor experience. As a child, Ben’s family camped at state and national parks in 40 states. As a teenager he joined Boy Scouts. In the 1970’s Ben celebrated in his first Earth Day as a volunteer. In high school Ben added lifeguarding to his skill set and in college began work as a fitness instructor too. 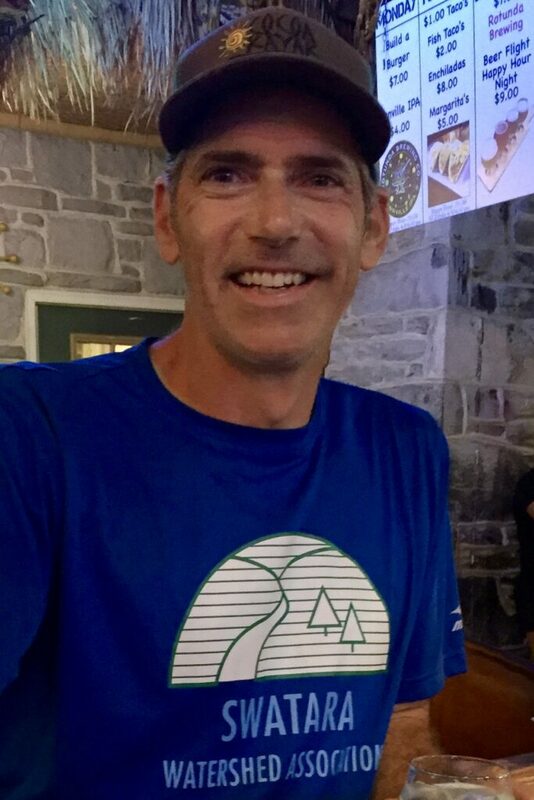 Running since the age of ten, Ben has competed in 5K, triathlon, and numerous cross sport challenge races. Ben’s outdoor enthusiasm has taken him abroad to hike, kayak and ski. 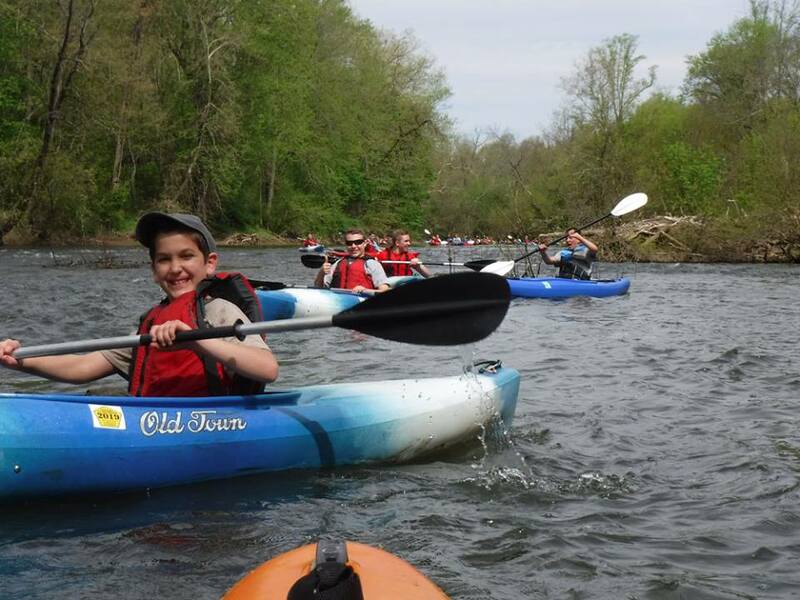 In 2012 Ben joined the Swatara Watershed Association, and later the same year established the outfitter Cocoa Kayaks of Hershey. 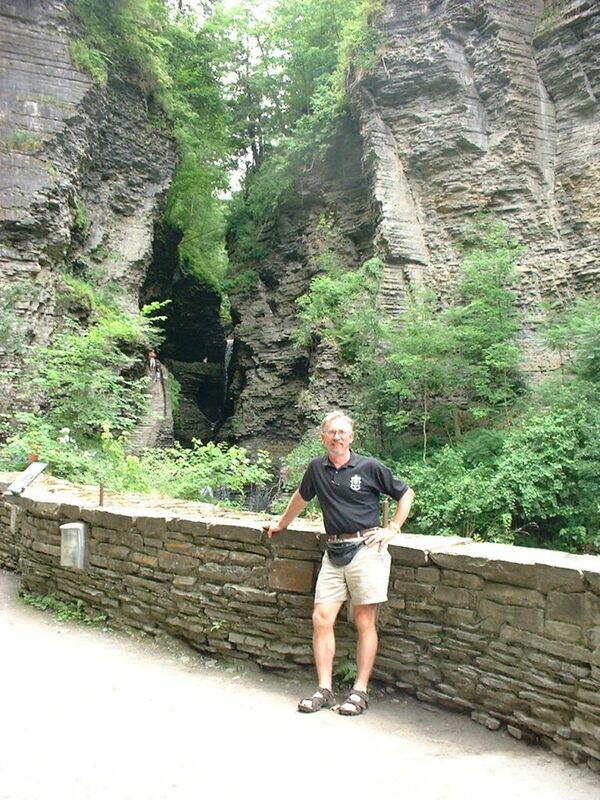 In 2013 Ben accepted a board member position in the Swatara Watershed Association (SWA). Since most SWA projects are in the outdoors, Ben finds tremendous fulfillment as a volunteer. Fred is a retired earth and science teacher who loves the outdoors. He is always ready to help with a cleanup, down a dead tree, or share his knowledge of the Spotted Lantern Fly. Fred shepherds the Little Swatara Creek, and serves as secretary on the Bethel Berks Environmental Advisory Council. Board members: Mike Adams, Hershey Outfitters; Bob Arnold, Hershey Foods, retired; Gavin Bender, student and Eagle Scout; Charles Cravotta, USGS; Stephanie Harmon, Watershed Specialist, Lebanon County Conservation District; Ann Lasky, retired nurse, Quittapahilla Creek rep; Jack Stouffer, retired from Milton Hershey School; Tom Embich, retired Earth Steward Environmental consultant, HACC instructor, founding member;and Mike Willeman, Construction Drafting Services.